Especially in households where each person is a different dosha, these spice mixes called "churans" can help balance out meals that are either tri-doshic or, say, too Vata for the Kapha in the family. Sprinkle these on foods for a touch of flavour that your body will thank you for! Pictured here a blend I made using ingredients from the Pitta and the Kapha churans, since I'm a Pitta-Kapha (without mango powder as it was unavailable). For all spice mixes, mix well and store in an airtight container. Sprinkle on foods while cooking for yourself or add to finished meals (soups, salads, sandwiches, stews, rice, casseroles, pasta dishes, vegetables, etc). 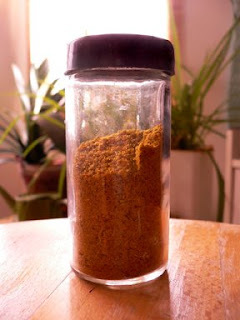 Thanks Fran for the spice mix, will sure go and give it a spin. Good health and peace to all! Sounds like a good idea, Carol! and i now have a personalised spice formula that is easy to adjust to my taste and to the seasons, thanks for the inspiration which bridged me from dreaming to action! I'm pretty sure that you mean 'churna' (which means powder- not dosha spice mixes, not Churan. Where did you get your recipes from, they are definitley not the traditional mixing of spices...just wondering. I have a recipe calling for tridoshic charna - do you have a recipe for that? I have a recipe calling for tridoshic charna - do you have a recipe for that? Thanks! Churna, not churan. Your recipes aren't bad, but they are much, much simpler than recipes I've received from Ayurvedic experts. Also, different churnas are meant to be used for balancing during different seasons, not just for a person's individual dosha.